Shark Week! I can’t believe it’s been 25 years of Shark Week! It has been one of the biggest highlights of our summers since my youngest son was a very little boy. Really, what can be better than a summer night with the family gathered around the tv, a giant bowl of popcorn and the air conditioner vent dumping a cold breeze down on top of you? Sharks, of coarse, and lots of them. Our family decided to throw a little “birthday” celebration for Shark Week this year to celebrate 25 years of terror fun and serve all the kinds of dishes that would put a smile on a great white’s face. No seal blubber, but plenty of fish tacos, ahi poke and ceviche, lots and lots of ceviche. We practically live on shrimp ceviche around here. It’s a fast, easy, healthy recipe and above all, no cooking or hot stoves required. The only rule to ceviche is that… there are no rules! You can mix the barely cooked fish or seafood with just about any fruit or vegetable and serve it in any way you wish from a lettuce wrap to a tortilla chip. I keep things interesting by mixing up all kinds of concoctions and wild variations of ceviche during the hot summers. 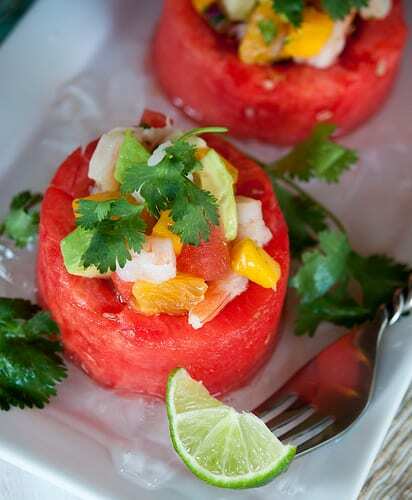 This particular ceviche recipe is filled with tropical fruit and served in a watermelon cup, a rather easy version, but not your average tomato, red pepper, onion on a tortilla chip, either. All the stars of summer are packed into this Shrimp Ceviche Recipe; mango, papaya, avocado. I dressed it up with Watermelon Cups for the party but, you can serve it in a bowl or a hollowed out end of a watermelon with chips or lettuce leaves for an everyday dinner or lunch. All the stars of summer are packed into this fast and easy Shrimp Ceviche in Watermelon Cups. It's the perfect hot weather meal. Peel and dice shrimp into ½ inch pieces. Toss with the scallops in a medium sized glass or plastic mixing bowl. Mix the orange, lemon and lime juices together and pour over shrimp mixture. Stir to make sure all of the seafood has been coated. The seafood should be completely covered with the citrus juice and have enough room to "float." If not, add more lime juice. Cover the mixing bowl with plastic wrap and allow the seafood to "cook" in the refrigerator, about 1 hour for medium rare and up to 4 hours to cook all the way through. Check the seafood often after the first 45 minutes. While the seafood is marinating, cut the watermelon into 2 and ½ inch thick round rings. Use a 3 inch biscuit cutter to cut the watermelon into round, red circles. Carefully level the bottoms with a pairing knife if the circles are not quite level. Scoop the center of the watermelon circles out with an ice cream scoop leaving a nice ¼ inch rim around the watermelon cups. Dice the watermelon "scraps" into small to ½ inch dice. Cover and chill. Peel and dice the mango, papaya and jicama into ½ dice and add to the diced watermelon. With a sharp knife, remove the peel and pith from the orange by placing the orange on a cutting board and slice from the top of the orange to the bottom, cutting long strips of peel and pith. Cut the orange segments from the interior membrane and dice into small dice. Add to the fruit. When the seafood has finished marinating, drain the liquid and toss with the mixed fruit. The liquid may taste a little like the scallops but, you can reserve it to toss the avocado in if you want the avocado to stay bright for several hours. Add the minced onion and grated Habanero or jalapeno. Dice the avocado and mince the cilantro and add to the ceviche at the last minute. 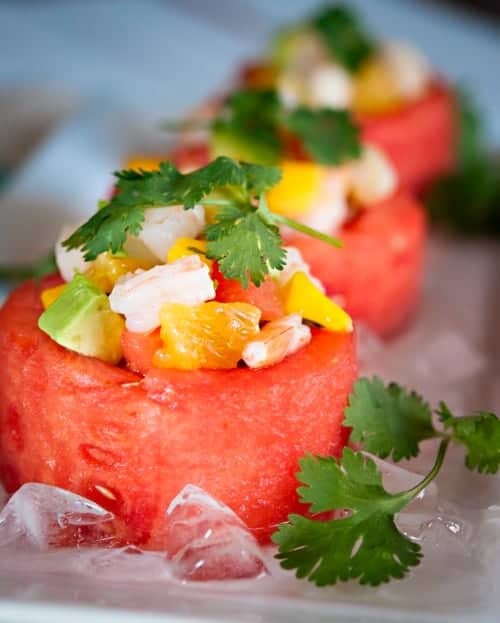 Spoon the ceviche into the watermelon cups and garnish with lime wedges and sprigs of cilantro. Serve on lettuce leaves or mixed greens if desired. If you are new to ceviche and aren't certain about cooking with lime juice, just poach the seafood in boiling water first. Be quick though, 2 minutes is all it takes. Plunge the seafood into an ice bath to stop the cooking. Then, reduce the marinading time to about 30 minutes. If you don't want to make individual watermelon cups, no problem. Just cut off one end of the watermelon and scoop it out to make larger bowl and serve the ceviche "family style." This recipe will keep a day or two in the refrigerator if you don’t mix in the avocado. Make a big batch and use the leftovers for a cool and refreshing lunch. Just add fresh avocado at the last minute to each serving. Thanks for stopping by and please leave us a comment or follow us on Facebook. We love hearing from you. Omigosh, I’m feeling the ceviche love for your watermelon cup presentation. 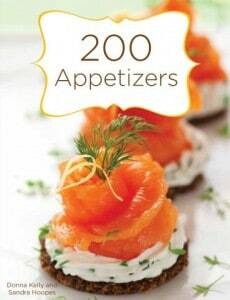 What a great idea, and a refreshing dish for late-summer dining. You just keep out-doing yourself! This is beautiful. Ahem: I’m waiting for my invitation to the shark night party. You make it sound delightful. What a great ceviche recipe and the presentation is beautiful! Being a ceviche lover, I am in awe of this recipe. Gotta have some! This looks perfect! Great summer dish. I can’t wait to try it before summer is gone! Thanks for sharing. In the directions you mention “avocado”, but it’s not listed in the ingredients. How much did you use? Tried this recipe at my grandsons graduation party and it was a Great success.! I’m so happy you liked it, Carol! Thank you for letting us know! It looks good but I am a little scared to try it. My son would love it though.